Steep and Cheap - SAC Alerts: Ski, Oakley, North Face, Patagonia Deals Texted to Your Phone and more! Settings: Once you log in, you will come to the Settings page. Use this page to change/update your information. Take a few seconds to make sure your information is correct or alerts will not reach you. Also make sure your alert delivery method, product gender preference and times you wish to receive alerts all correspond to your desired settings. Now you are ready to set your alert triggers. Keywords: Keywords allow you to specify Keywords that you think will appear in the product title. For example: tent, osprey, sleeping bag, headlamp. 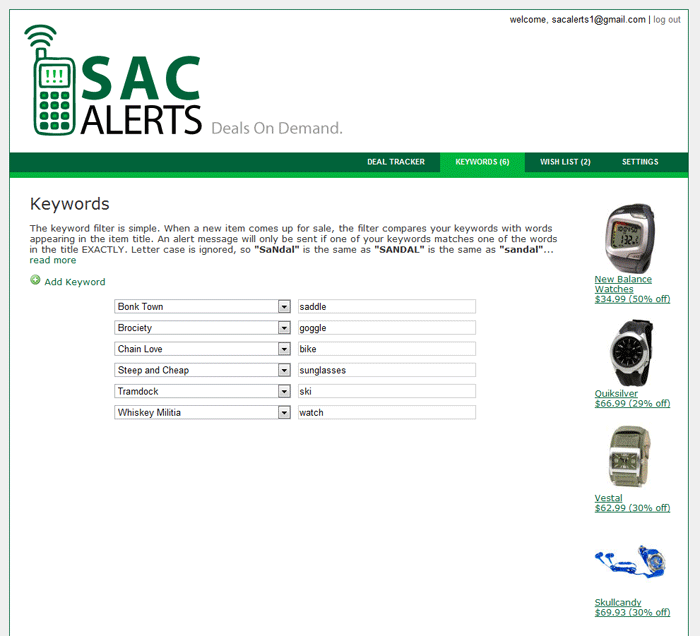 When a new item is listed on Steep and Cheap or a sister site, SAC Alerts iterates through each word in the product title and compares them to user specified Keywords. If they are the same (letter case being ignored), you are alerted. However, they must be the same. If you specify the word sandal and the item name is Patagonia sandals, you will not receive an alert because sandal is not the same as sandals. You can choose to specify both sandal and sandals to make sure you don't miss a deal. Keywords contain an auto-suggest feature which lists words that have appeared in product titles in the past. Wish List: The Wish List method is much more accurate, but less general. In your Wish List you can view the past 50 items offered on Steep and Cheap and sister sites and checkmark any items you would like to be notified of should they become relisted. The reason the Wish List works is because most one deal at a time websites will relist an item several times. 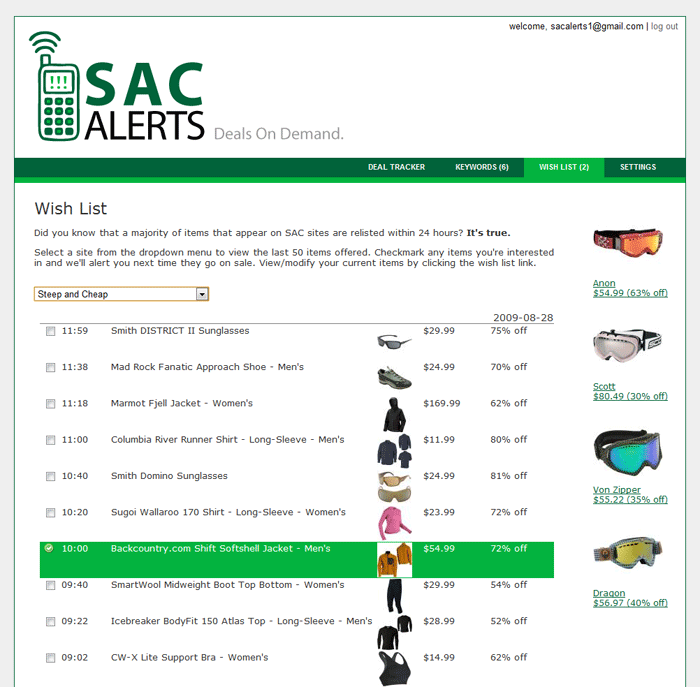 Don't panic if you happen to miss an item, just check mark it in your Wish List and SAC Alerts will let you know the instant it become relisted. Still have questions? 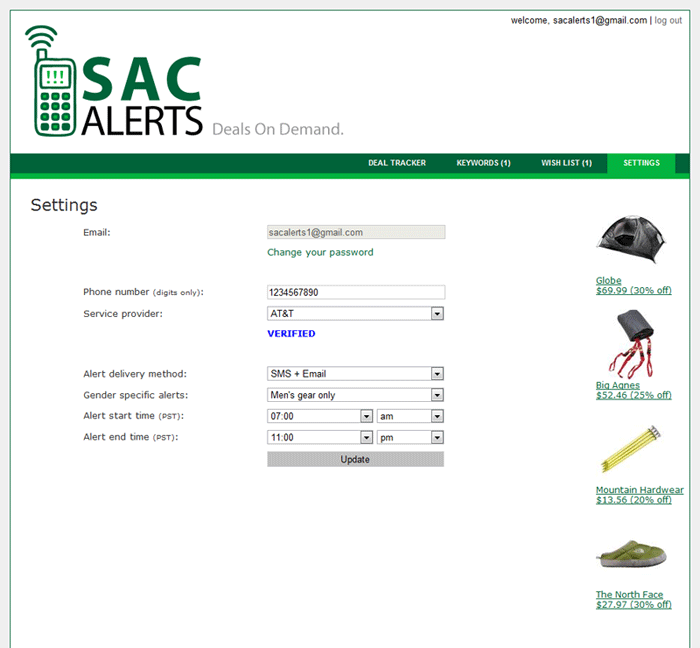 Email me at [sacalerts1](at)[gmail.com].